Thank you for requesting information from Onder Law by logging in with Facebook. We will contact you via e-mail with more information about Talcum Powder Ovarian Cancer Lawsuits. Who Can File a Talcum Powder Ovarian Cancer Lawsuit in Washington? If you or a loved was diagnosed with ovarian cancer and have a history of talcum or baby powder use you may be entitled to damages. We provide free no-obligation Washington baby powder ovarian cancer lawsuit case review. We do not charge attorney fees unless you receive compensation and you are under no obligation after your initial consultation. The attorneys handling Washington baby powder cancer cases at Onder, Shelton, O'Leary have vast expertise in handling claims of individuals against large, billion dollar corporate empires. These experienced litigators in cases of harmful drugs and other products have seen the aftereffects of numerous hazardous products and drug recalls. Recognizing the seriousness of these talcum powder ovarian cancer cases, this national drug litigation law firm is offering its significant resources to provide clients in Washington with the best baby powder cancer legal representation possible. These Washington baby powder ovarian cancer attorneys will provide a free case review to persons in Washington who were diagnosed with ovarian cancer and have a history of talcum powder use for perineal hygiene. The Onder Law Firm’s Washington talcum powder cancer attorneys provide experienced legal representation without fee unless they collect for their clients. We will represent all persons involved in a Washington talcum powder lawsuit on a contingency basis, meaning there are never any legal fees unless we win compensation in your case. For a free no-obligation consultation please fill out our short online contact form and one of our attorneys handling baby powder lawsuits in Washington will contact you to answer any of your questions. After examining internal company documents and hearing testimony from multiple medical experts, a jury in St. Louis has ruled in favor of plaintiff Jackie Fox, ruling that the cancer that killed Ms. Fox at the age of 62 was caused by her regular use of Johnson's Baby Powder. The verdict essentially confirms that talcum powder can cause ovarian cancer, an assertion first made by scientists as early as the 1970s. Johnson & Johnson was found negligent of failing to warn consumers of the talcum powder cancer risk, and of concealing the risk from Americans. "All their internal documents show they knew talc caused ovarian cancer, and actively undertook to hide the truth, not only from the governmental regulators but from the public," Jim Onder says. Onder's firm, The Onder Law Firm, is a leader in talcum powder litigation and represented the Fox family. Jackie Fox contacted a law firm after seeing a TV ad about talcum powder ovarian cancer lawsuits. "The sad part is, she had to learn about it from lawyer ads, while Johnson & Johnson tried to hide the truth," Onder lamented. Jackie Fox's son, Marvin Salter, expressed relief that at least his mother's lawsuit would serve to warn other women of the danger of talcum powder when used for feminine hygiene. "They were preparing for litigation for over 30 years. They went out and intentionally 're-engineered the science', hiring members of 'the club' to misrepresent medical literature," Onder explains. "The club", a term used in an internal J&J document, refers to a group of doctors seen as favorable to the company and willing to side with J&J's stance that talcum powder was harmless. Internal documents reveal J&J comapny officials engaging in a complex strategy to rewrite the public record on talcum powder cancer research. 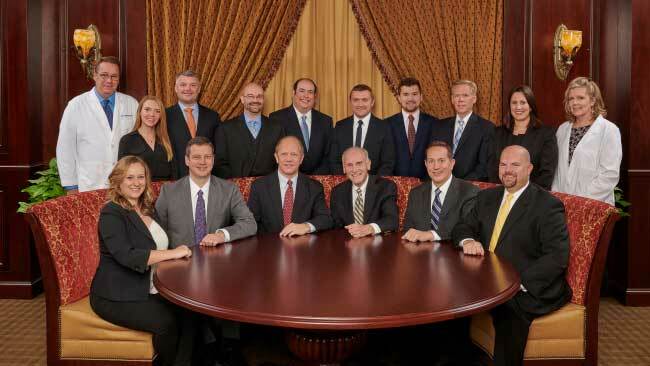 Onder, Shelton, O'Leary & Peterson, LLC is a St. Louis personal injury law firm handling serious injury and death claims across the country. Its mission is the pursuit of justice, no matter how complex the case or strenuous the effort. Onder, Shelton, O'Leary & Peterson has represented clients throughout the United States in pharmaceutical litigation such as Vioxx, Digitek, Ethex and others, and other law firms throughout the nation often seek its experience and expertise on complex litigation. For more information, visit www.onderlaw.com or call 1-877-ONDER-LAW. Disclaimer: The choice of an attorney is an important decision and should not be based solely upon advertisements. Past results afford no guarantee of future results. Every case is different and must be judged on its own merits. The accident, injury, personal injury, and/or other legal information offered herein by The Onder Law firm, is not formal legal advice, nor is it the formation of an attorney client relationship. In order for our firm to be considered your attorney there must be a signed agreement between the client and the firm. The Onder Law Firm is a National Law Firm based in St. Louis, Missouri representing clients throughout the United States in national MDL products liability litigation.